My Sunday routine is set. After church service I do my food shopping for the week’s staples: fresh fruit, vegetables, yogurt, snacks, my ever-essential avocados. Though I don’t create a weekly meal plan I generally have a menu in mind and shop accordingly. 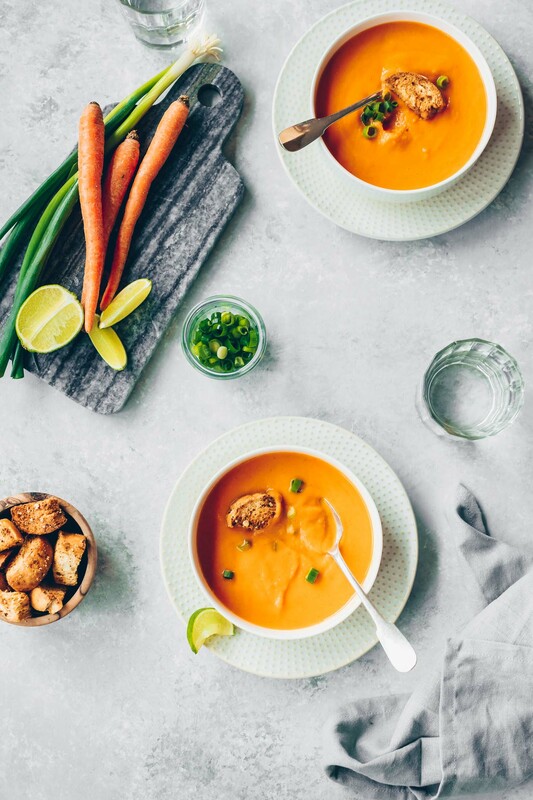 The mid-week trips to the market are to supplement the staples, usually fresh meat (typically fish or chicken), bread, wine and the random ingredient(s) needed to complete a particular dish. On a recent Sunday I returned home from the farmers market with a treasure trove by way of fresh mushrooms–chanterelles, oyster and shiitakes. I knew exactly how I wanted to serve them and I wouldn’t wait until mid-week to enjoy them. Sunday dinner would be special. But as it often goes, this dinner I had in mind didn’t happen last Sunday. Neither on Monday. Nor on Tuesday and Wednesday. For each day that passed the freshness that attracted me to the mushrooms in the first place also ticked by. I was afraid that the most delicate of the bunch, the oyster mushrooms, wouldn’t survive one more day but thankfully they did and our Thursday night meal was one my husband proclaimed to be one of the best he’d had in a long time. Flattered by his comment, it also gave me pause. The hazard of being married to a food blogger, apparently, is that I’m always on the hunt for the next recipe to share here. 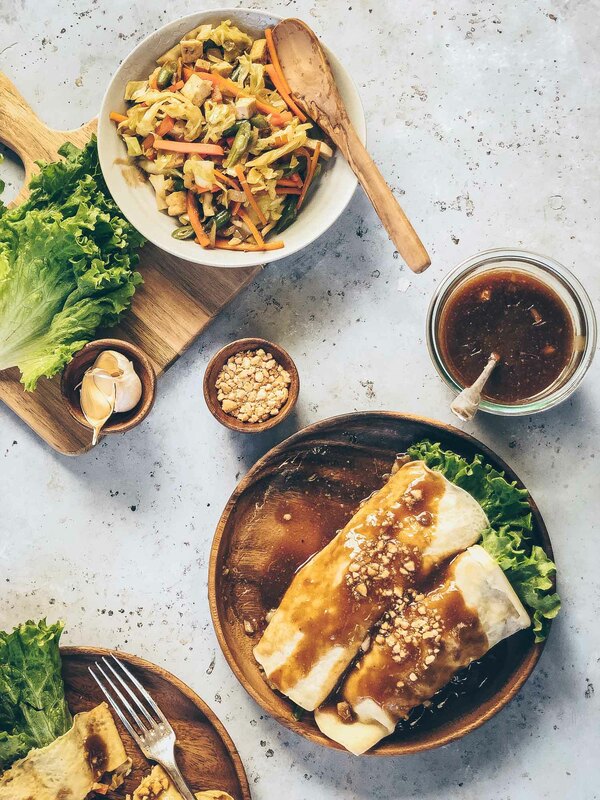 While we do repeat quite a few go-to meals, some end up being one-hit wonders when they really do deserve more time in the limelight. This is one of those dishes that my husband is determined not to allow to get lost in the blog archives. And I would agree. We loved the medley of mushrooms paired with fresh pasta. As simple as this was to prepare we delighted in the delicate texture and complexity of the dish. In addition to the fresh ones I also used a small amount of dried porcini mushrooms, mainly to be able to use the stock that would come out of rehydrating them (in hot water). I threw in sun-dried tomatoes as an afterthought but they turned out to be a worthy addition. I like to make fresh pasta whenever I can but it’s not absolutely necessary here. You might lose a little of the delicate texture but the taste won’t suffer. Feel free to use any combination of mushrooms–dried or fresh–that you like (or is available). Using dried pasta this dish will not take very long from start to finish and you might be just as happy with it as we were. I know I won’t wait very many Sundays before I once again fill my shopping basket with a fresh supply of these mushrooms. 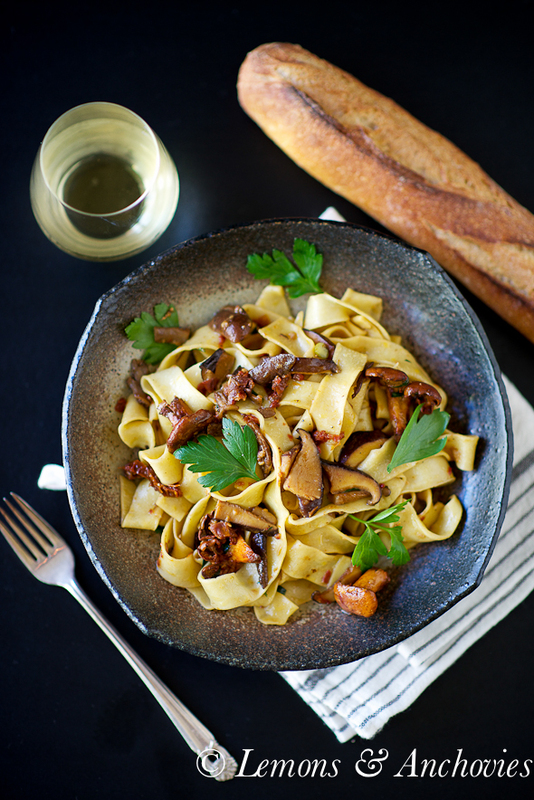 Mushrooms and sun-dried tomatoes pack a major punch in this simple pasta dish. Pasta: You can use dried pasta for this (just cook until al dente and reserve some pasta water) but I think it's better with fresh. Click on the link above to prepare my homemade pasta. You won't need to use the pasta cutter once the pasta sheets have been rolled and dried on the counter for 15 to 20 minutes. Just lightly flour the sheets (so they don't stick), roll them up and cut them finger-width, about 10 mm. Toss in a bit more flour until you're ready to use them. To prepare the mushrooms: Soak the dried porcini mushrooms in 1 cup of very hot water (just under boiling) for about 20 minutes to rehydrate. Reserve the water but strain out any dirt or particles from the mushrooms with a sieve. Roughly chop the rehydrated mushrooms. To cook: In a pan large enough to accommodate the pasta, heat ¼ cup of the oil and 1 tablespoon butter over medium heat. Add the fresh mushrooms and cook for 2-3 minutes then add the garlic and some salt and pepper. Cook for an additional 2-3 minutes. Add the sun-dried tomatoes, rehydrated mushrooms and 1-2 tablespoons of the chopped fresh parsley. If the fresh mushrooms have absorbed most of the oil, add another tablespoon or two. Add the mushroom liquid and turn up the heat to medium-high. Cook until the most of the liquid has reduced, about 2 minutes. Feel free to add more oil at this point if you feel it needs it. I like to add it throughout the cooking time. Add ¼ cup of the pasta water, taste for seasoning. Add the chili flakes or chill sauce if using then add a splash of cream just to thicken the sauce a little (2-3 tablespoons). Toss in the pasta. You can add the lemon juice here if you like. Add more pasta water and/or oil if too dry for your taste. Sprinkle the rest of the chopped parsley, plate and serve. Garnish with Parmigiano-Reggiano. Your fresh pasta is so gorgeous, Jean! 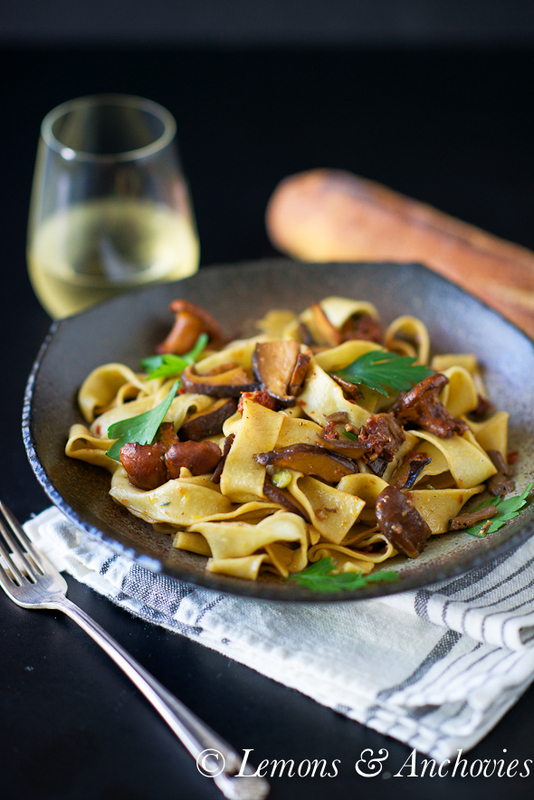 Love this dish – sun-dried tomatoes and mushrooms are some of my favorite things! 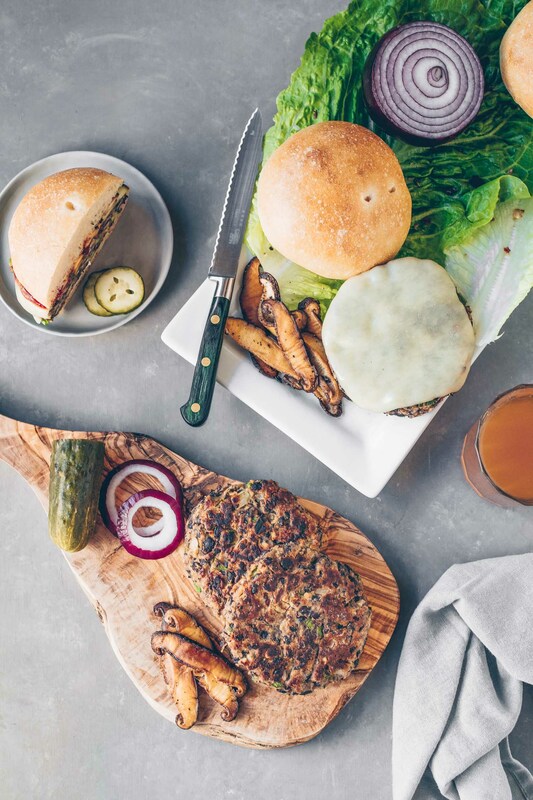 Wow, love the use of multiple types of mushroom to add depth to the dish! And avocados are also a staple for me! Oh this looks amazing!!! Lovely colors and I bet the flavor combo is delicious! A beautiful tagliatelle dish! 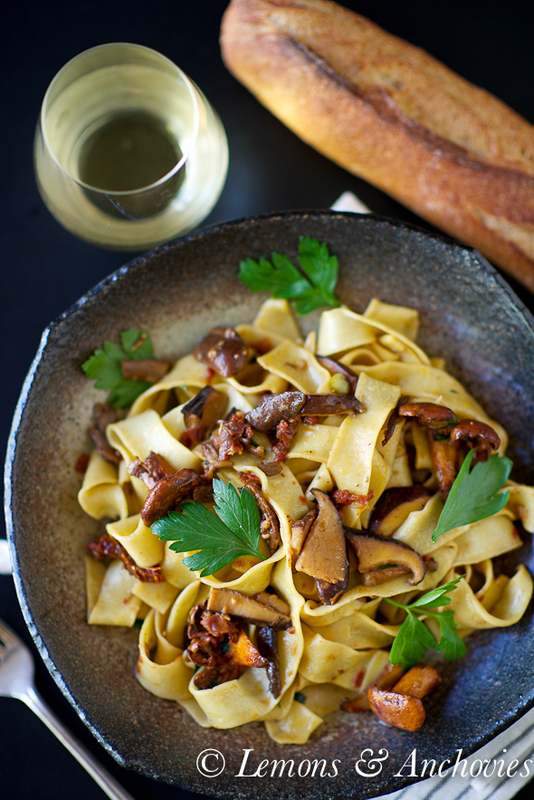 Fresh pasta can’t be beat and mushrooms as well as sun dried tomatoes are just divine. Wow, what a beautiful pasta dish…I love the variety of mushrooms…I can only imagine the fragrance of this dish…and homemade pasta? Yes! Perfect all the way! Have a great week Jean…oh! Before I go…awesome pictures! 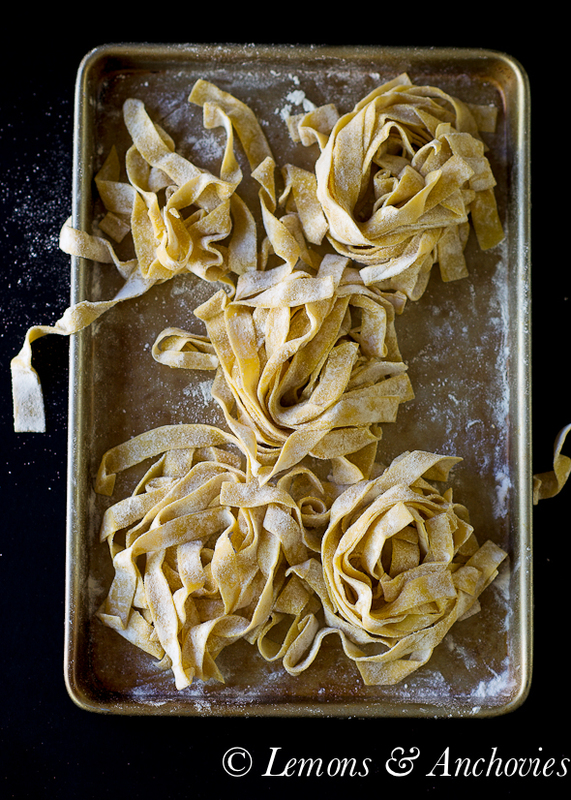 Loving your photography of this gorgeous tagliatelle dish.. pinned! 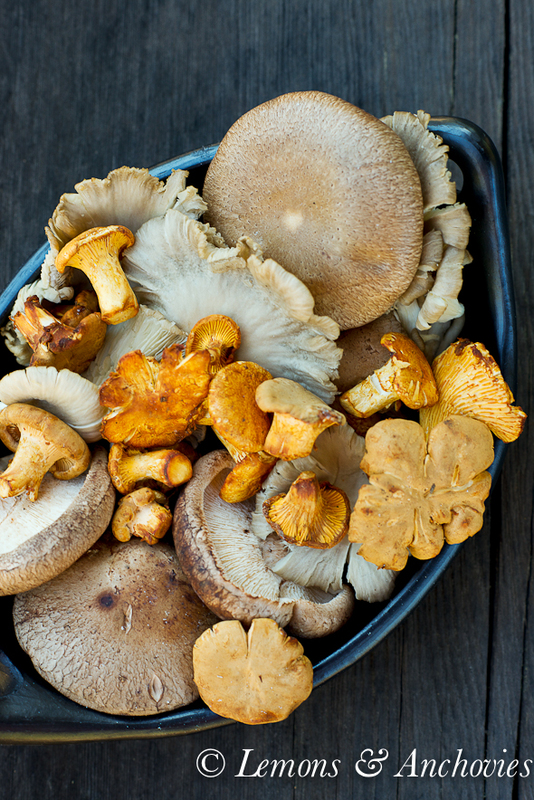 I love this dish, it makes me want to run out and forage for mushrooms! Gorgeous photos, too. I’m already craving pasta & a healthy amount of delicious carbs.